Our Toddler Inflatable Rentals in West Palm Beach, Fort Myers, Naples or any of the other surrounding areas in South Florida are great for the little ones. When planning a party or event, it's important to make sure that all age groups have fun activities. Our toddler bounce combos can be rented wet or dry and are perfect for cooling off in the hot Florida sun. All of our inflatable rentals are cleaned and sanitized before every rental. Also, our units are all produced by the top inflatable manufacturers in the world, ensuring that they all meet or exceed industry safety standards and regulations. For us, fun is only second to safety. Looking for something for the bigger kids or even the adults? Be sure and check out our obstacle course rentals. 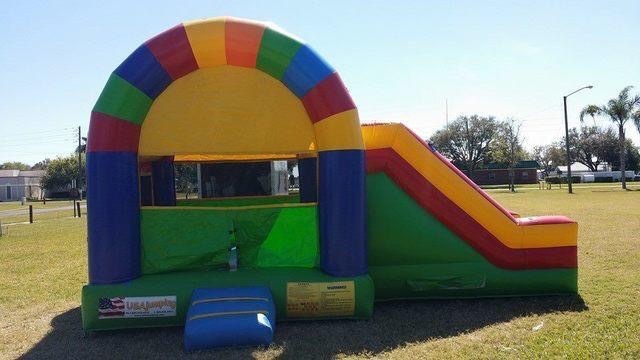 Busy Bee Party Rentals has the best selection of large, colorful bounce house rentals for our customers with toddlers in West Palm Beach, Naples, Fort Myers, Loxahatchee, Wellington, Clewiston, Belle Glade, Lehigh, Immokalee and other surrounding areas in South Florida. Find out what 5 star service is really all about with Busy Bee Party Rentals. Browse the selections below and click the image or title for more information and to request a quote. We welcome all questions, please contact us for inquires and orders. Click below for the best Toddler Inflatable Rentals in West Palm Beach, Naples, Fort Myers, Loxahatchee, Wellington, Clewiston, Belle Glade, Lehigh, Immokalee and other surrounding areas in South Florida.